Ahhhhh, the joys of gardening with children! How lovely to watch their sense of wonderment! To see them skipping and frolicking in the flowers! To observe with pleasure as they learn to nurture and respect the earth! 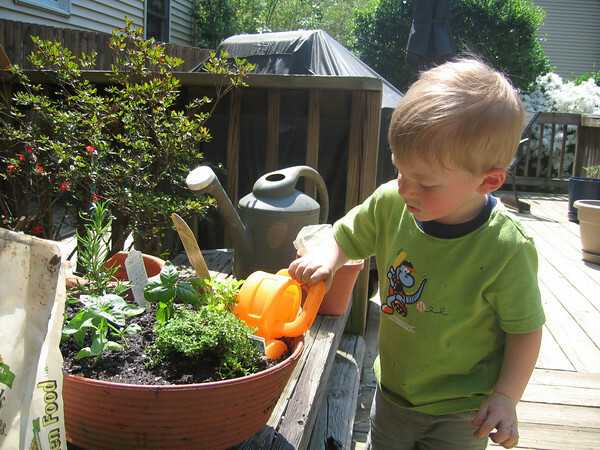 Here is a photo of my dear son, at age two, helping me plant a pot of herbs. Isn’t he just adorable with his pudgy little hands and his tiny plastic watering can? What a tender scene…helping Mommy water the plants! Isn’t it all just so sweet? Fortunately, no photographic evidence exists of the time that my son wandered outside and decided to dig up one of my meticulously designed and newly planted beds. Yup, just grabbed his little “Garden Pals” shovel and systematically unearthed two deutzia, three foxglove and seven carex. For no explicable reason! Well, actually there was a reason. I’m pretty sure it was: the sheer pleasure of destruction. Thank God there is no record of my cries of hysteria upon discovering the twelve little quart size plants lying prone next to their planting holes, like disinterred corpses. I am also grateful that the ensuing chase through the house, the slamming doors, and the tearful, anguished re-planting session were not recorded on video or film. So yeah, Gardening with Children can be one of life’s great pleasures. Or it can be like Lord of the Flies. Take, for example, my son’s relationship with the animal kingdom. Once, while I was out weeding, Charlie spent an entire hour building a cute little house for worms! Every time I would unearth a worm with my weeder, he would pick it up with tenderness and delicacy, and place it gently in the little domicile he’d crafted from sticks and grass. Then he would coo at them, try to feed them, and set up play dates for them with Japanese beetles. Oh wow, I thought. I am doing such a good job raising my son, teaching him to love and respect even the tiniest creatures. He is like a cross between Albert Schweitzer and Gandhi. What is wrong with these other parents who can’t teach their children basic respect for life the way I am doing with my son? “Sure, honey,” I say absently. A few minutes later I hear a loud smack! “What are you doing?” I ask. Oh my God, I think. They say an early sign of sociopathic behavior is cruelty to animals! How did this happen? Why isn’t he building little worm houses anymore? A week ago he was acting like Gandhi and now he’s acting like Ted Bundy! Where did I go wrong? Let’s take a look at some world-renowned artwork that depicts children in the garden, shall we? Here’s a nice one. 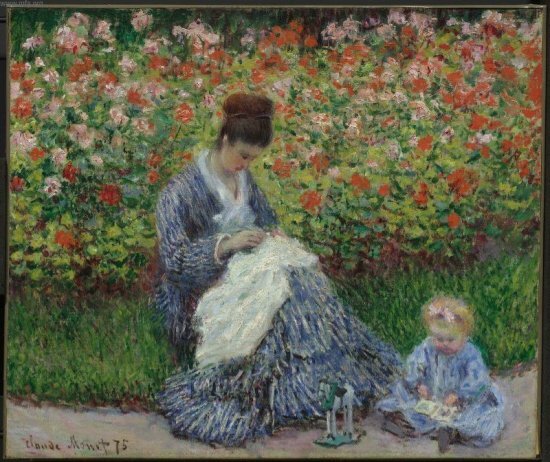 It’s by Claude Monet, and the title is: Camille Monet and a Child in the Artist’s Garden. I like that title — Camille Monet and “a Child” — not her child or their child, just A child. Maybe some passive child they borrowed from the local orphanage. Maybe some fantasy child. Maybe their actual child wouldn’t sit down and read her book while Daddy painted, but rather thought that trampling or beheading all those poppies or phlox or whatever they are would be so much more fun! There’s a reason Monet doesn’t have any works entitled: Little Michel Defoliating the Dahlias with a Jack Knife. But you know stuff like that had to go on even at Giverny! See, with kids in the garden, it can kinda go either way. This entry was posted in ruminations and tagged camille monet and a child in the artist's garden, gardening with children by Mary Gray. Bookmark the permalink. So cute! Here is my 2.5 year old with his daddy in our yard which is not a garden yet. That picture above in your post of the bronze “child” with a frog is positively disturbing. I’m gonna have nightmares, I know it. Kinda looks like the “Chucky” doll from the horror movies. The Monet painting, with “a child”…now that’s hilarious. I’m sure there’s some art history major lurking around here that can answer that one. Anybody? I remember my older son adopting worms as pets while I was working in the garden. He would carry them around, kiss them, cuddle them, until they expired from all the love. He’s 25 now, so he doesn’t do that anymore. At school we were working at the teacher spent the morning showing the little darlings how to plant herbs and bulbs. At the end of the lesson it was time to pack up, so of course they packed up to the frustration of the teacher in that they dug everything up again to put it all away !!! That’s hilarious. I guess they were just really good at following directions! Speaking from experience, the Ted Bundys of the garden don’t worry me. It’s the Al Bundys that scare the hell out of me. Ha! I actually had to google ‘Al Bundy’…it’s been so many years since that show was on I had forgotten all about it. So nice of you to put it back on my radar…. What a great blog. Gardening with children really is wonderful…some of the time! My garden tools always end up as stakes for forts, and I have decorative iron fencing that I place around delicate plants to prevent damage from misdirected soccer balls! I have lots of that cheap, tacky wire fencing that I put around plants — but more to protect them from my dog, who is also quite destructive. The wire fencing definitely takes away from the aesthetics, but without it, I’m pretty sure half my plants would be dead. Thanks so much for reading, Emma! A school class, grd 1/2 shared in our planting day at our community garden. All said & done with, great joy fun & refreshments, a couple of the youngsters were “caught” digging up seeds to see if they were growing yet? One adult went ballistic but I will not cut the opportunity to let kids get dirty or the kind of fun the “little troopers” had that day! Excellent! Let the kids have their fun, eh? So great that they get to be involved in the planting! I giggled in glee as I read this to my wife. I spend lots of time in the garden with my son. It gets less picturesque every day. Ha-ha! “Picturesque” it is not. Still tons of fun, though. Enjoy! I’m afraid about the only gardening thing I ever did with my girls was to teach them (and the dog) not to walk in the flower beds. When my daughter, at age 12, had a party at our house, I was appalled to see that no other parents had passed on this basic rule of life. I walked by the White House a couple of weeks ago and saw the famous vegetable garden. Later, I thought how sad it is that Michelle is always obliged to invite schoolchildren over to “help” her plant. I imagine she’d just like to have a little quiet time with her dirt. I think it would be interesting to find out exactly how interested Michelle O. actually is in gardening. Either way, I think what she’s doing is great, but she doesn’t strike me as a dirt-under-the-fingernails type of gal.